The folks in Tyler Texas are launching their own writing conference this June 28-29. It may be small the first time, but Tyler is a great place to visit and they have excellent speakers like my good buddies Mitchel Whitington and LaRee Bryant. For my lesson in Tech For Writers, I need to get the nice folks in Tyler to spell my name correctly. Don't let spell check or lack of double-checking mess up a name. 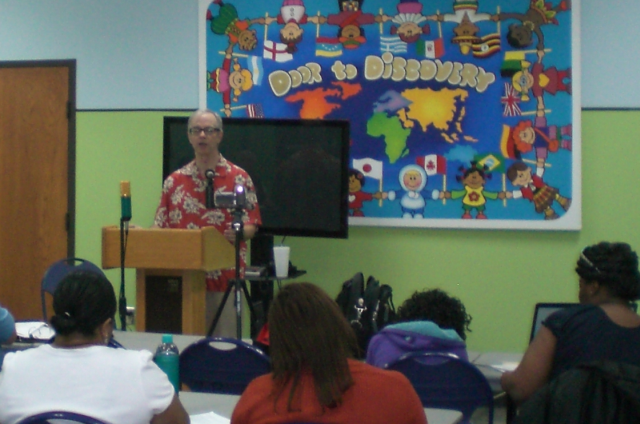 Last week, as I mentioned in the first post, I was invited to speak at the Dallas Area Writers Group (DAWG) meeting on May 13. They meet at the Cedar Hill Library (Zula Bryant Wylie Library) on Cedar Street. Yep, lots of 'Cedar' names all over the place. I visit the group two or three times each year as part of a critique panel, but it's been several years since I spoke solo to the group. Over the years, the regulars have become more friends than audience, and they are warm and welcoming to new members. If you're on the south side of Dallas or mid-cities, they're just off Highway 67. A couple of members drive all the way from Mexia. Go by the second Tuesday of the month at 7:00pm and make some new writer friends. Since I was talking in part about social media, I had to walk the walk myself. Here's a photo from the back of the room. Speakers: Always take photos from the back of the room and your 1000-head filter to make it look like you have, well, a 1000 people hanging on your every word. This isn't my best microphone, but it's the prettiest. 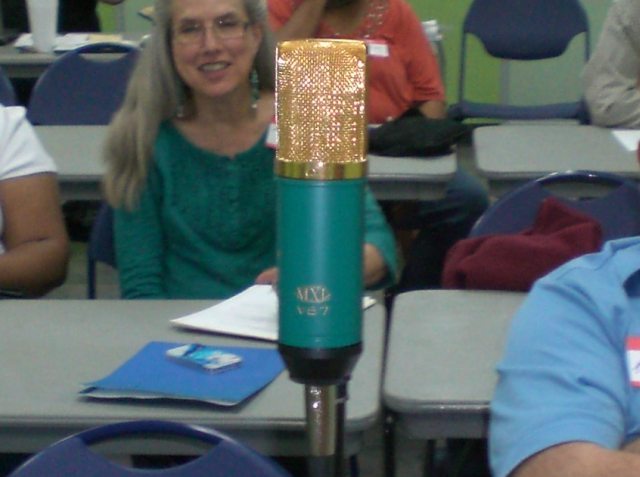 Most speakers don't use such an obtrusive mic, but I was making a point. Plus, I use the mic for recording music, not just speeches, and large diaphragm condenser mics are great for recording strings. Stay tuned for video and audio clips from that speech and others. If you want more details about the recording equipment, leave a note in the comments. Welcome to this new blog set up to illustrate the speech I gave to DAWG (Dallas Area Writers Group) on Tuesday, May 13th. Hope you enjoy it, and come back regularly. As promised, below is the handout. Feel free to cut and paste and use yourself. I just ask that if you share this, you give me credit at least once. New: bigger image in profile, pin your favorites, add images. MailChimp, Constant Contact, Vertical Response etc. Not authors, but leading book reviewers etc. 2-4 tweets per day recommended.